What’s top of mind for your state? Reporting requirements? Transcript data available in EDI or PESC XML schemas? Providing alternatives to the standard High School Diploma? Parchment has, not only partnered with 11 states to unlock the data within their credentials statewise, but also partnered with GED and HiSET to provide students an easy, online interface when obtaining their high school equivalency diploma. It’s time to experience the difference between an average vendor and a true partner. Ready To Experience A True Credential Partner? Give every high school and higher education institution in your state access to the Platform that has processed over 40 million records since 2003. Support all record types in school branded storefronts and provide students with a free, online ordering experience with Parchment Send. Bring your state licensing and certifcation programs into the future by going digital with Parchment. Issue verifiable & shareable certifications through the platform already trusted by states to send and receive credentials. The bragging rights are up for grabs. Your move. The path to graduation is a long and winding road. And we want to help you support all students looking to continue their education. California HiSET and 21 GED State Jurisdictions have partnered with us to provide students their alternative diploma. Will you be next? 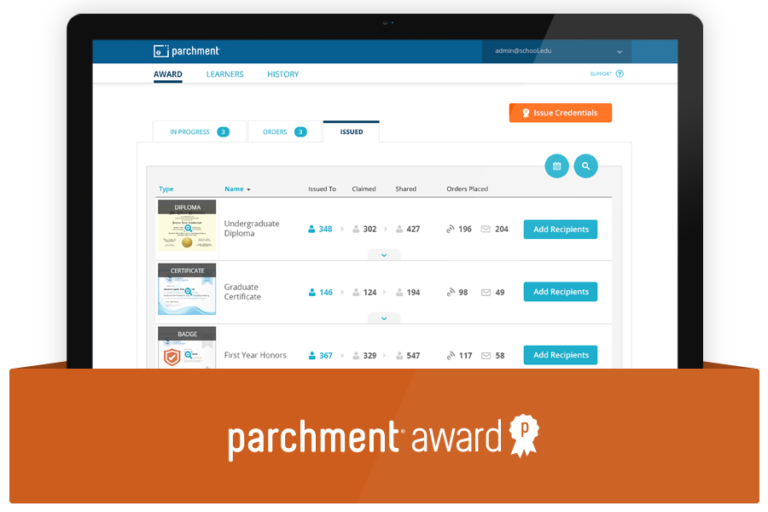 GED Testing Service has partnered with Parchment to provide digital transcripts and diplomas for many of their jurisdictions.